Speaking of things that are beautifully designed, our Nest thermostat arrived today and I wasted no time in installing it. It's unfortunate that, for no good reason at all, our builder ripped a bloody huge hole in the wall to accommodate the original thermostat so I was forced to use one of the optional mounting plates to cover it up. 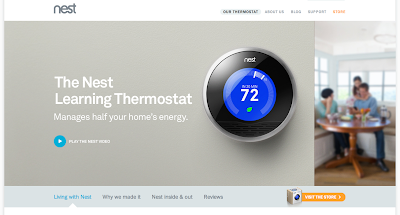 It detracts from the minimalist beauty of the Nest a bit, but other than that this thing is really a work of art as thermostats go. And yes, nerd alert, I can now control my thermostat from anywhere in the world via my iPhone.